While we all hoped she’d lay low in her first year removed from the White House, former First Lady Michelle Obama has instead remained pretty active. Actively embarrassing herself, that is. While the following recap may get you riled up, there is one positive to be drawn from it all – At least by way of contrast, she’s showing everyone why it’s such a huge relief to have Melania Trump representing America now. Let’s recall some of the more notable times Michelle Obama, an embarrassment for much of the previous eight years, stayed relevant as an embarrassment this past year as well. Former First Lady Michelle Obama argued that female Trump supporters went against the cause of their gender by voting for Trump. “Any woman who voted against Hillary Clinton voted against their own voice,” she told the crowd at a conference in Boston. Between @MichelleObama and @HillaryClinton, leftist women sure aren’t very inclusive – unless you think like them. Obama added that a woman voting against Hillary didn’t reflect poorly on the candidate, it reflected poorly on those women. That seems kind of sexist. Just sayin’. Obama dressed up like Beyonce from the “Formation” video as part of the singer’s 36th birthday celebration. In the video, Beyonce controversially dressed like a member of the militant Black Panthers organization. In the “Formation” video, one can see a police car in New Orleans sinking, along with a “STOP SHOOTING US” message painted on a wall. At a leadership summit hosted by the Obama Foundation, the former First Lady took the opportunity to mock men, ridiculing them for not talking to each other enough and sorting out their emotional issues. Obama came to this conclusion when she watched one of her husband’s State of the Union speeches. Had she opened her eyes up a little bit wider, she might have seen people on the Republican side the likes of Tim Scott, Elise Stefanik, Joni Ernst, and Mia Love. 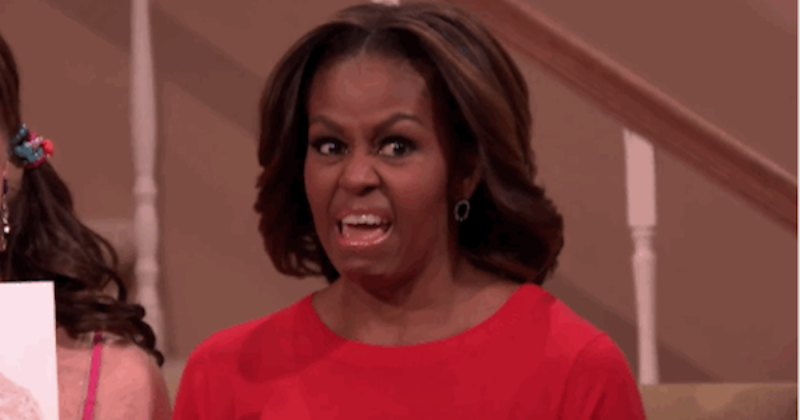 Her husband was elected the first black president in America’s history, but that didn’t stop Michelle Obama from complaining about all those racist Americans. Yea, Michelle had to endure racism after eight years of an Obama presidency that was supposed to cure America of it. How ironic.